The 'Paris of the North', the 'Capital of the Arctic', the 'Gateway to the North Pole'; discover Tromsø. Tromsø is known as 'the Capital of the Arctic', being Northern Norway's most populated city as well as its social and cultural capital. Visitors to this enticing city can be sure to experience a lively nightlife, dazzling restaurant scene and striking architecture. As well as the city lights, Tromsø is well known for the Aurora Borealis. Our Northern Lights adventures to Tromsø combine not only this fantastic city but also stunning rural destinations of Northern Norway such as Sommarøy, the Lyngen Peninsula, Malangen and Senja. With our adventures to Norway, you can expect the perfect blend of city lights, Arctic adventures and Northern Lights. The city has a beautiful backdrop, with fjords and mountains starting just outside the city limits. The harbour front here is also an idyllic location to visit and helps to provide the plentiful fish that can be sampled in the increasingly ambitious and high-quality restaurants here. The city is well known for its cultural diversity and there are plenty of different cuisines and flavours to try. Other attractions in this welcoming city include the Fjellheisen Cable Car up Mount Storsteinen which gives excellent panoramic views of the city and can be enjoyed by day or night. There is also the Arctic aquarium, Polaria, and The Polar Museum which discusses the Arctic explorers who have passed through the city and a lot of the worlds 'most northern' attractions including the university, botanical gardens and planetarium. Following only a short drive from the city, you can find yourself in a world of wilderness. Fjords and mountain scenery surround this city and guests can explore this landscape through a variety of thrilling activities. This city is an ideal base from which to explore the area and gives you access to a wonderful mix of Norwegian experiences. Whilst Tromsø is famous for its Northern Lights record, it is always best to escape the sodium lights of the city after dark if you want to witness an Aurora at its best. That is why for all Aurora hunting activities, we take you out beyond the city so that you can find the most appropriate location and the darkest, clearest skies for Northern Lights displays. Travel to Tromsø in autumn to search for the Northern Lights and you will also experience the delights of Sommarøy; the island, known for its Aurora record, is a mix of white sandy beaches, charming fisherman’s cottages and rugged mountains. 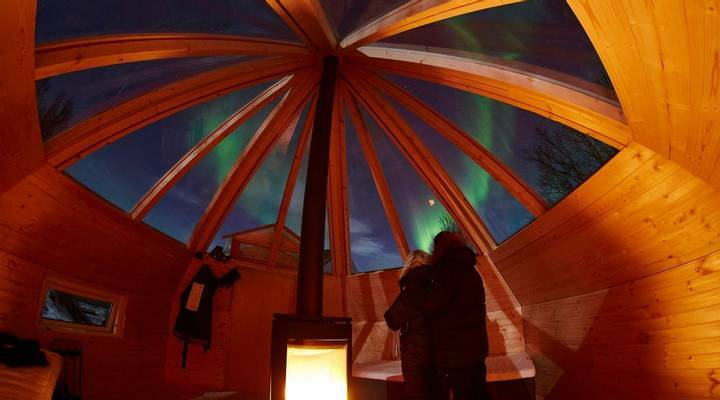 Additionally, in autumn, a tour of Tromsø and the Lyngen Alps will give you the opportunity to stay in a Crystal Lavvo - a glass-roofed cabin providing the perfect glimpse of the dark Arctic skies. In winter, Northern Norway transforms into an enchanting winter wonderland, with the fairy-tale fjords and magnificent mountains dusted with a blanket of white snow. On our winter adventures, you can explore Tromsø and the stunning coastal resort of Malangen on our Grand Aurora Tour.